Ashta matrikas Maha Yagna - Eight Goddess and their Goodness at Once! History behind the creation of AshtaMatrika's: In Ancient times, there carried on a mighty evil presence named 'Andhakasur'. Andhakasur had gotten to be presumptuous due to a shelter of immortality got from Lord Brahma. Being tormented by Andhakusar, all the gods went to look for master brahma's assistance. Ruler Brahma took the divinities to master Shiva who consented to murder the evil devil - Andhakasur. The fight initiated and a wild double battle broke out between Lord Shiva and Andhakasur. Shiva assaulted Andhakasur with his trident. Stream of blood overflowed out from the injury, yet to Shiva's absolute surprise each one drop of blood falling on the ground brought about into production of various Andhakasuras. Presently Shiva's displeasure crossed all breaking points and he thundered boisterously. Flares radiated from the mouth of irritated Shiva coming about into the appearance of goddess 'Maheswari'.similarly, seven more goddesses showed themselves from diverse gods - Vaishnavi from Lord Vishnu, Brahmani from Lord Brahma, Indrani from Lord Indra, Kaumari from Lord Karthikeyan, Varahi from the Lord Varaha, Narasimhi or Pratingira from Lord Narasimha. All these eight goddess came to be known as "Matrikas" and the Lord allotted them the favourable day for their! What is exactly Ashtamatrika Maha Yagya? The objective of performing AshtaMatrika Maha Yagya is for invoking the divine power of eight goddess through this maha fire ritual. This Maha havan goes for two days the first day is full of Japa and the next day will be homam for eight goddess. Benefits and Significance of Ashtamatrika Maha Yagya: The main and common benefit of performing AshtaMatrika Maha yagya is that the devotees will get blessings from all the eight divine goddess and also blessed with various boons in life to overcome struggles and get frees from any kinds of evil effects. 1. Brahmani Homam: Brahmani Homam helps to get a mental peace by avoiding over stress. 2. Vaishnavi Homam: Vaishnavi homam is helpful to get relief from any sorts of dangerous things and frequent mishaps in life. 3. Maheshvari Homam: Maheshvari Homam helps an individual to get relief from any sorts of danger causing from animals. 4. Indrani Homam: Goddess Indrani blesses her devotees with complete joy in life. 5. Kaumari Homam: Goddess Kaumari blesses her devotees with the power to defeat the struggles and to get relief from heat related diseases. 6. Varahi Homam: Goddess Varahi ward away evil eye casting, black magic and misfortunes in life. 7. Chandi or Chamundi Homam: Chandi Homam bestows a person with the power and supremacy to achieve all endeavours in wider extend. 8. Narasimhi or Pratyangira Homam: Narasimhi or Pratyangira Homam fulfils the requirements of an individual by avoiding lawsuits, enemies problems and other issues in wider extent. How to organize Ashta Matrika's Maha homam? 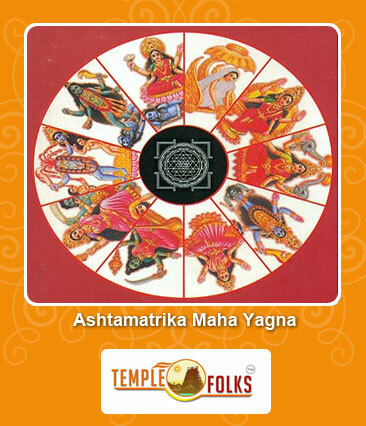 To conduct Ashta Matrika Maha homam, one should seek support from a leading Vedic firm for obtaining optimum results. Vedic folks is a reputed Vedic consulting company which helps to organize the homam with powerful mantras and fire rituals. 24/7 online support is available for those who want to book the homam in advance. Live T V shows are also offered for watching the homam from anywhere.